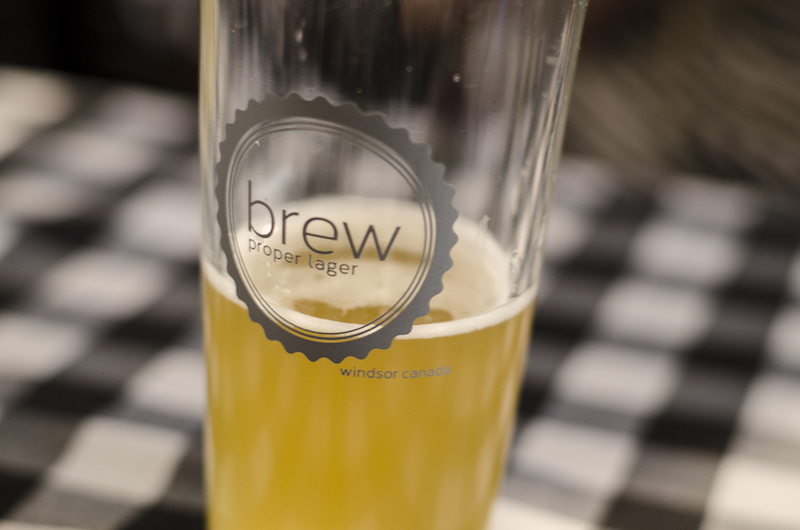 Brew has officially opened their doors! Brew has officially opened their doors. Last night, brothers Jordan and Josh Goure officially opened the doors to Brew and are inviting the public to come taste their creations. When WindsorEats broke the news about Brew back in February, the brothers had originally planned to include a full service bar. Those plans changed as they decided they wanted to keep the focus on their beer. Instead, several mixed drinks have been made with their Proper Lager. Which beer cocktail do we recommend? The Michelada. Simply put, it’s a Caesars with beer in the place of the Clamato. It includes their Proper Lager, Worcestershire sauce, Tabasco, a salted rim and garnished with pepperoni. Their food menu is simple yet tasty with items such as a pretzel with malted bacon, nachos and pizzas. All good things to munch on while enjoying a cold beer.